It is easy to romanticise the past. Especially so when the time period in question has littered popular culture since with as many cliches as the 1920s – think jazz, flappers, liberalism, emancipation, and then throw in the images of parties, cocktails, and the pursuits of the well-to-do, which inevitably includes more booze and parties. I have always been fascinated with the stories behind the cliches, and it is probably because of this that I really enjoyed Waugh’s Vile Bodies. Unlike Stephen Fry’s film Bright Young Things, which is based on Waugh’s book, Vile Bodies offers quite a dark perspective on the smart set. For example, Adam’s and Nina’s quest to get married seems almost as Kafkaesque as Adam’s pursuit of the nameless colonel who holds Adam’s winnings of a racing bet – the very money that would allow the couple to start their future together. And all of this futile chase could have been avoided if someone had had the sense to ask a simple question. But that is one of the recurring themes in the book – nothing is questioned. What follows, is that we, as readers, are following a story that has no answers. To me this makes the depiction of the Bright Young Things somewhat fated, somewhat tragic, but also comical in a twisted cringe-worthy sense. Like watching the hero or heroine of a Greek tragedy unravel. However, some of the scenes are written in such a stark and unsympathetic way that it is hard not to be touched by it. 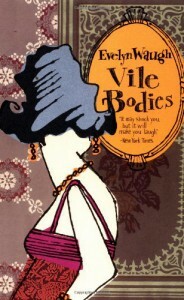 Vile Bodies was written as a satire of its times but scenes like Agatha’s nervous breakdown lift the book from mere satire or parody and lend to it something that evokes compassion and sadness. And for this alone, I rate Vile Bodies highly, even though Waugh himself was very critical of his work.